During this season of giving, as you reflect on what matters most and how you choose to make a difference, please consider a gift to Nantucket Community Sailing. With your support, Nantucket Community Sailing enriches the lives of the Nantucket Island community by promoting a love of the sea and a sense of joy and confidence through the sport of sailing. * Scholarships and free sailing totaling $150K to those who otherwise may not have had the opportunity to get out on the water. * Outreach programs for year round Nantucket children, youth from both the Boys & Girls Club and the STAR Program, hospice clients and Island seniors. Your help makes the difference! It takes the support of friends like you to make all of this happen. With your help we will maintain our fleet, preserve the quality of our programs and most importantly, honor Nantucket's heritage by providing access to the water for the community. 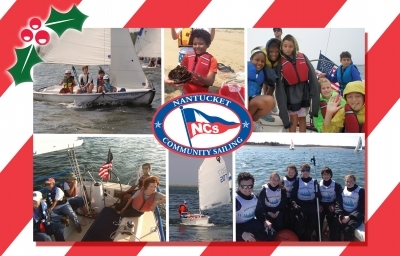 We hope you too feel NCS is an organization worthy of your support and will give a gift to help keep Nantucket sailing by CLICKING HERE today! To those of you who have already given NCS a year end gift, thank you so much for your support! Wishing you snug harbors for 2014!